That is a gorgeous looking box of tricks you have there, Julio. I sense that eurorack is becoming more and more digital. Hi Anthony.....It is becoming more digital. My system is about 50 /50 analog and digital. The most exciting modules do seem to be coming from the digital side, oscillators, processors and Fx. An analog oscillator will be just that and much needed but a digital oscillator does not have to operated by analogs guidelines that still have not really changed over the years both in design and circuitry. Perhaps electricity has its limits. Even though my system is half of its former size it is still very capable and with the addition of the Bitbox sampler now has actually more potential than when it was a larger system. a $45 reverb plugin (a nice one too), becomes a $500 eurorack module !!! Compare that to Behringer coming out with a complete 3 osc Model D synth clone in eurorack format for around $400. Yeah things do get more expensive once you put on a nice suit and tie....Sean Costello of Valhalla DSP is the coder for the Eos soft verb for Audio Damage. Not sure if there was any new coding for the eurorack module. Halls of Valhalla dsp card for the $500 Tiptop audio Z-DSP FX module was $75 and Shimmer was $75. I have had them. Generally Im not that fond of reverb within the eurorack format....but this seems a lot more focused. 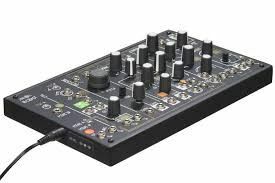 As to the Behringer Model D....from what I have seen it sounds very good but a Moog model D....No. Better to have the Moog Mother 32. I sense this is Berhringer trying to prove some sort of point. Hopefully this might spark Moog to enter the eurorack market and do it right. APK posted in the "currently listening" r Beny's, Full Blossom of the Evening...a mostly eurorack modular recording so I thought id post some of his modular video performances here. There are quite a few more videos that you can track through youtube. Yes, he has some fine youtube videos. Also videos on the Electribe 2 ... solo, and with other instruments. As in third one above. It's his work that made me pick one up. Now it appears that everything that digital can offer is being ported over to it, and you see more SD cards hanging out of the modules. It had to happen I guess. I did pick up the little Make Noise 0-coast recently. Certainly fun to play with. Flexible architecture. Nice! I'm thinking about a 0-Coast myself, cause I like small these days. Ants seems like a good partner for it, so I'm pondering this one too. Yep, Ants looks interesting. Was not so keen on the sound in the demo vids though. But its the wrong color to sit with the 0-coast! does not match the 0-Coast colouring, while the Ants even have the same knob style. It's interesting how the visual appeal is important to us as artists too. I can see the Ants as 4 LFOs, 2 ARs and sundry modules for an 0_Coast, that also can make sound on its own, as a bonus. I can also image it as all of the above plus more Oscs for my MicroBrute - so it's still tempting. I'm bumping this to make it a little easier for me to find. I've finally started a small Eurorack system and I'll peruse everybody's suggestions and their modules. I plan to keep it small (and black) for as long as I can! Happy for you new sonic journey.....it is an amazing adventure. I had a lot of modules come through my system while I had it. I don't recall any module that was not good, some could be one trick ponies when they seemed like they could do more, some took up to much real estate for their function but all did what they were designed for and the sound and build quality was always excellent.